BBC Radio 4 - The Briefing Room, A Ceasefire in Syria? Why has it been so difficult to find peace in Syria, and what are the complicating factors which are getting in the way of a deal? 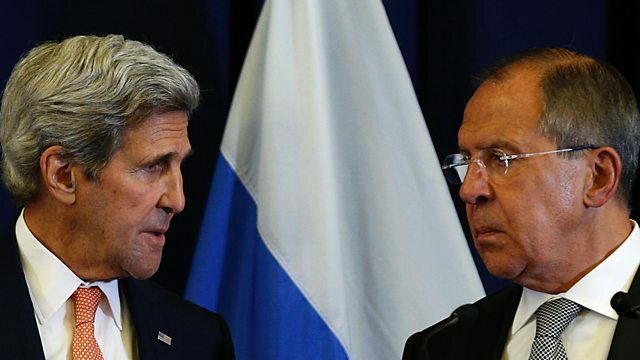 In early September the US Secretary of State John Kerry and Russian Foreign Minister Sergei Lavrov announced a new agreement to reduce hostilities in Syria - the second attempt this year to initiate a ceasefire in a 5 year long civil war which has so far cost around half a million lives and displaced millions more people. Within a week of the announcement, the US had bombed President Assad's troops - an accident, it says - and Russia was accused of blowing up an aid convoy. The deal looks like it is disintegrating fast. So why has it been so hard to find resolution in Syria? Could it be that international intervention is part of the problem - elongating the war, rather than finding resolution? In this week's programme, David Aaronovitch and guests explore the hugely complex process of negotiating peace in Syria - one which involves multiple international players, hundreds of opposition groups, a jihadi insurgency and an arrogantly defiant Assad regime. What is the missing link in the current negotiations which could sustain the country's progress on the path to peace? Why is Donald Trump accused of being Vladimir Putin's man? How have British Special Forces developed and what are they doing in Syria and Libya? Turkey's president blamed the recent coup attempt on the Gulen movement. What is it?